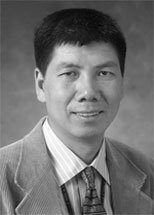 Congratulations to Laboratory Fellow Jun Liu on being named a Battelle Distinguished Inventor. This annual award is given to researchers who have 14 or more U.S. patents to their credit as a direct result of their work at Battelle. During his career at Battelle, Jun has been granted 18 U.S. and 18 foreign patents. He has also authored numerous disclosure reports and has additional patents in the application process. Jun's research includes cutting edge programs ranging from fundamental studies of molecularly organized nanostructural materials, to self-organization of complex proteins, to the development of unique materials aimed at a particular application. His work has helped establish the field of self-assembled, functionalized nanoporous materials. His team developed "Self-Assembled Monolayers on Mesoporous Silica (SAMMS)," and received the 1999 R&D 100 Award for potential applications in environmental and chemical industry. In addition, Jun routinely publishes technical papers in leading journals and has co-authored and edited several books. His research has received considerable attention in the scientific community and popular press. Congratulations again, Jun, on this important award!